Rocky Mountain Rebels, a select side, claimed top honors in last night’s championship of the Super Summer Sevens League at Cranmer (Sundial) Rugby Fields in Denver, defeating Titans Rugby out of Parker in the title match. The Insurgents reached the Cup Final with victory over PAC Rugby in their semifinal, while Titans proved the big surprise in defeating Denver East to obtain their finals berth. East topped PAC in the Plate Final, and Northside Dragons bested Reformed Jesuit Selects to take the Bowl. Rebels ran to halftime ahead 10-nil on trys by SWARM’s Matt Kincade and Saracens Siale Maka. Jake Novak opened scoring for Rebels in the second half and their lead increased to 15 before PAC’s Kyle Larson dotted to make the scores 15-5. A brace of groundings by the Rebels, Kincade’s second and a try by Will Vea, had the record at 25-5 at the last blast from field magistrate, Chris Huff. The Angels drew first blood on a romp around the corner for forty meters by Adam Leonard followed by a leveler by Titan, Josh Collins. East took the lead, 10-5, after a try by flyer, Angel Mendez, but scores were drawn at the half, 10-10, after Josh Lyons’ crafty dash through traffic. Lyons put Titans in front with a grounding after restart resulting in a giant advantage of 15-10. The Angels drew abreast Titans as Leonard picked up his brace, but a pair of trys by Titans, Jason Tolman and Collins’ second, made for a final scoreline of 25-15 for Titans. Northside Dragons opened scoring with a try by Mat Sands before Jesuit Cal Harrington knotted tallies with a strong run through the center of the pitch. Jesuit would take the lead, 10-5, into the break after a further grounding by Mark Ellerbroek. Trys by Dragons Mando Salicido, Trey Novinski and Santo Elizondo in the second stanza against a single for RJ by Taylor Egloff meant 20-15 victory and the Bowl Championship for the Dragons of the Northern Tier at referee Rick Goldammer’s final tweet. East Angels ran out to a 15-0 halftime lead on scores by: Angel Mendez, Blake Pullen and Adam Leonard. A try by PAC’s Marcelo Mayor made it 15-5 just beyond the restart, before Leonard touched down a further pair for his hattrick that extended the East advantage to 25-5. A grounding by Kyle Larson for the Front Rangers had the tallies at 25 and 10 to the Angels nearing time, before a final grounding by Pullen brought the record to 30-10 at the terminal whistle of referee Rick Goldammer. Rebels nailed hardware comprehensively in the Grand Final last night as they took a 25-5 advantage into the break and extended that margin to 30 with a scoreline of 40-10 for the record. The select side, coached by instructional prodigy, Ethan Pougnet, and managed by PRP champion, Cody Melphy, saw a hattrick of trys from Aurora Saracens Siale Maka in the first half abetted by touch downs of Utah-bound Will Vea and Ryan Maxfield, while Titans try came from Josh Lyons. Three more groundings by Rebels Joe Gallop, Cade Alcock and Maxfield’s brace against a lone score by Titans Mike Dellarotta made for a final of 40-10 at the end of the evening. Rebels pilot Pougnet, himself a Rugby Colorado alum and head coach of the elite side that has been making a name for itself in tournament’s across the country this summer, reflected on his squad’s performance: “The boys have been playing extremely well. (This season) we had taken second in Denver 7s, (falling) to Utah Lions and 3rd in the CRC’s in Philly. At (last weekend’s) Heartland 7s in Kansas City, I have never had a team play so well.” Rebels triumphed in the Heartland with final victory over KC Blues Academy. On his coaching staff, Ethan waxes effusive: “I think our staff has done a great job in bringing the best players together and developing their 7s skills. Cody Melphy is a top-notch instructor and organizer who has tons of knowledge for rugby. He runs the backs. “Kurtis Werner (American International College halfback and U-20 Eagle) is a backs coach and also our restart and technical specialist. Kurtis brings a good energy and leadership skillset to the club. 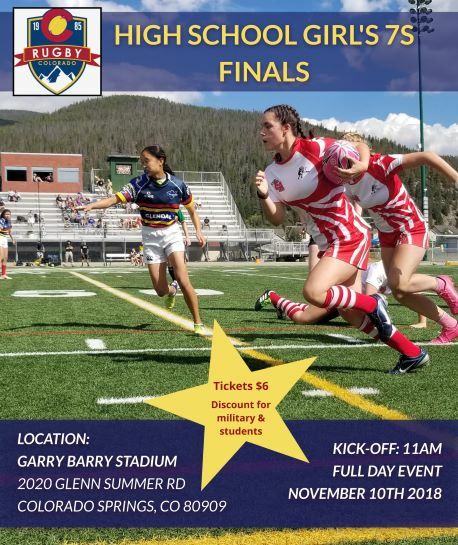 Rocky Mountain Rebels won the Celtic 7s in New Mexico at the onset of sevens season and scored the most points with the least amount scored-against at the CRC High school championships in Pennsylvania.